HOUSTON – (Sept. 4, 2012) – Researchers at Rice University and the Université catholique de Louvain, Belgium, have developed a way to make flexible components for rechargeable lithium-ion (LI) batteries from discarded silicon. The Ajayan lab reports this week in the journal Proceedings of the National Academy of Science on its technique to make carefully arrayed nanowires encased in electrically conducting copper and ion-conducting polymer electrolyte into an anode. 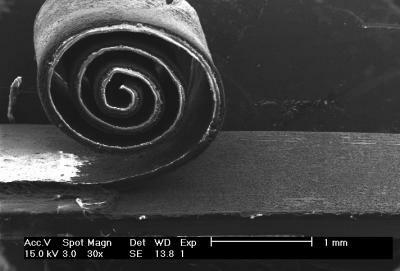 The material gives nanowires the space to grow and shrink as needed, which prolongs their usefulness. The electrolyte also serves as an efficient spacer between the anode and cathode. 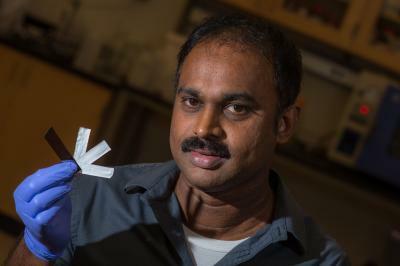 Rice University research scientist Arava Leela Mohana Reddy holds strips of anode material and a piece of waste silicon (at left). Researchers at Rice and in Belgium found a way to recycle silicon into flexible anodes for lithium-ion batteries. The silicon/copper/polymer composite can be rolled from its silicon substrate and leave a mask in place to begin anew the process of making another anode for a lithium-ion battery.